The most obvious form of nourishment is the food we eat. At its most fundamental level, the purpose of eating is to fuel our bodies with energy to keep ourselves alive, healthy, and functioning. Yet, if you ask yourself truthfully whether all substances that pass through your lips and into your stomach are done so with the pure intention of fueling a low-energy body, I highly doubt you’d say yes. I know I wouldn’t. I find it fascinating that the act of eating has grown to fill so many roles other than its natural purpose – oftentimes resulting in bodily abuse, ironically enough. From alleviating stress to providing emotional comfort to being a social pastime, the uses of food have become as varied and complex as our human lives. Perhaps one followed the other? As interesting as it is, I’ll leave the debate of how this has come to pass for another time. Instead I’d like to think about how we can bring the mindfulness, reverence and simplicity, back to our relationship with food. This is important because if we are abusing our use of food, we are abusing our bodies, and ultimately ourselves. Simplicity really is the key here. Food = Energy. Energy goes into the body -> body uses energy to function -> energy is depleted -> more food is ingested. 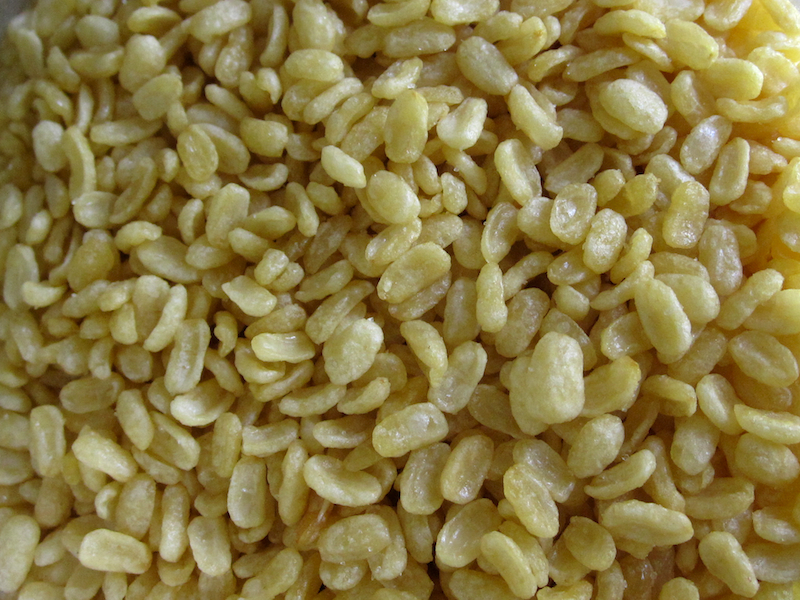 The purest of foods are those that are readily made available in nature. And aside from farming your own food, there is no better way to get in touch with the source of food than by shopping at a local farmer’s market. 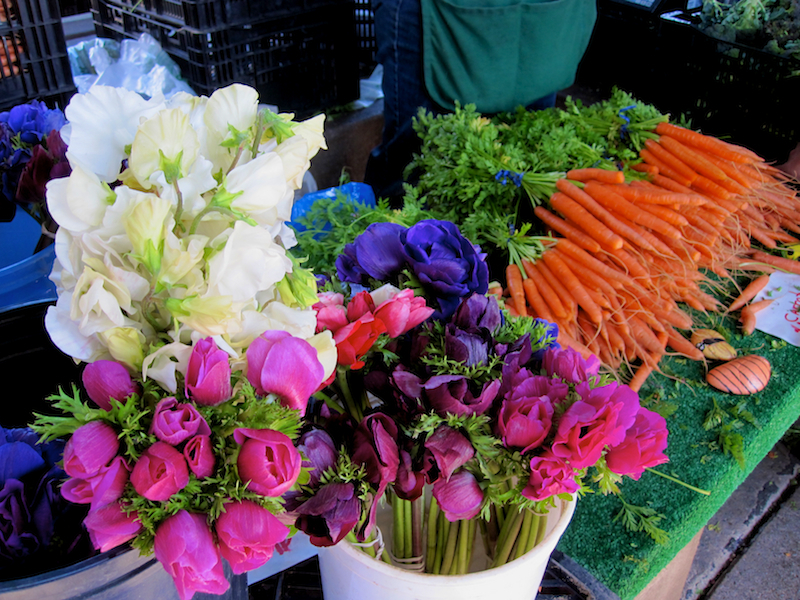 I am lucky enough to have a my pick of farmer’s markets in San Francisco. This morning I chose the larger option, Alemany, which also happens to be the oldest farmer’s market in the Bay Area. The beauty of shopping at a farmer’s market is that it provides not only physical nourishment, but also soul nourishment. I am invigorated by roaming outside freely in the sunshine amidst fresh fruit, flowers, and garden aromas. Even seeing the families with their cute children eating sliced oranges makes me happy. 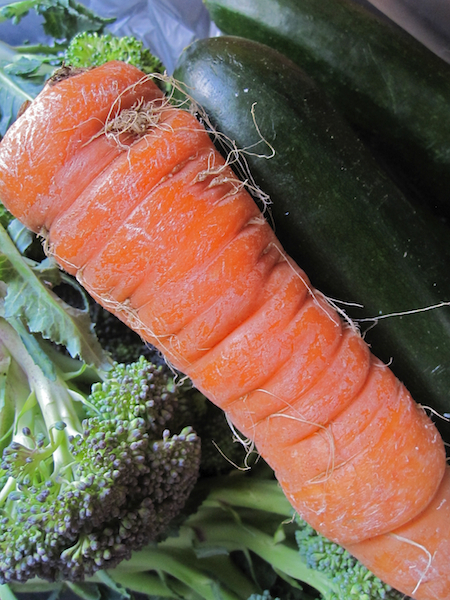 Purchasing food directly from the grower psychologically establishes the food-earth connection. 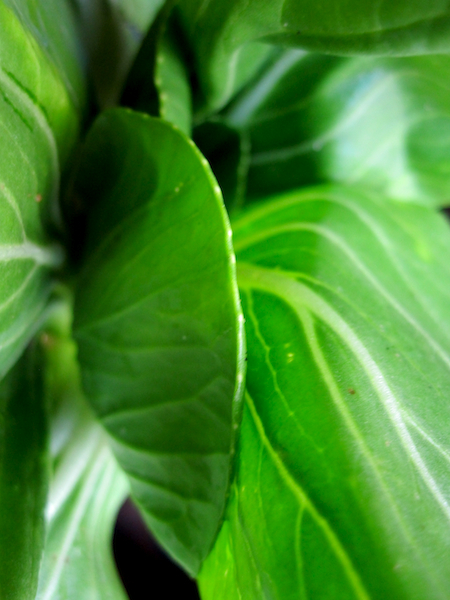 Even the effort that goes into growing the food cannot be overlooked, further deepening that appreciation. I can honestly say that there is something extra special about the Alemany carrots over those bought at Trader Joes. And it’s not just their cool rugged shape. Or excess of “hair”. 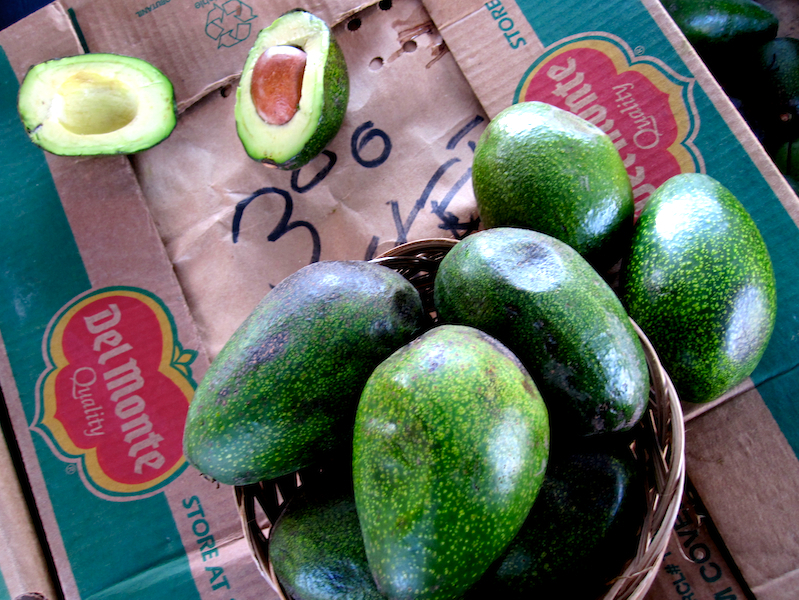 I simply regard them with extra appreciation, having met their grower and knowing their freshness. So I will be that much more thoughtful in how I use them. Roaming the farmer’s market is also a learning experience. This morning I learned what raw sugar cane looks like. Nowadays we commonly find sugar and every possible derivative of it in everyday foods. But do we even know where it originates from? (Sugar Blues is an awesome narrative on the history of sugar in the western world and its place in our common diet.) Below is a picture of where it comes from (the long, striped stalks on the right). Aside from using it as a walking stick, as I saw an older Asian woman do, it can be eaten by peeling the bark from one end and chewing on the inner flesh. 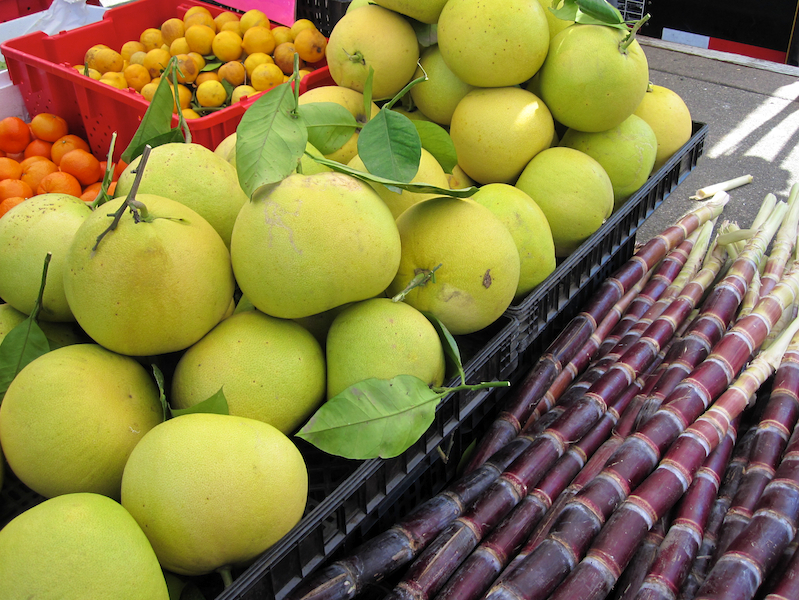 Those big green fruits to the left of the sugar cane are pomellos, which are about the size of watermelons and look like grapefruit inside. Though I didn’t try them, I enjoyed photographing them. I found a new kind of avocado that is exceptionally creamy and delicious, and bought baby bok choy for the first time. Making my way to the prepared foods section of the market (yes, there is a prepared foods section), I was beckoned by the seller at Sukhi’s Indian stand to try a handful of roasted Moong Dal lentils, which he said is full of protein and can be eaten as a snack or in salads. They are simply roasted in vegetable oil and salt, and since I liked their crunchiness and lightness, I decided to try a pack (below). 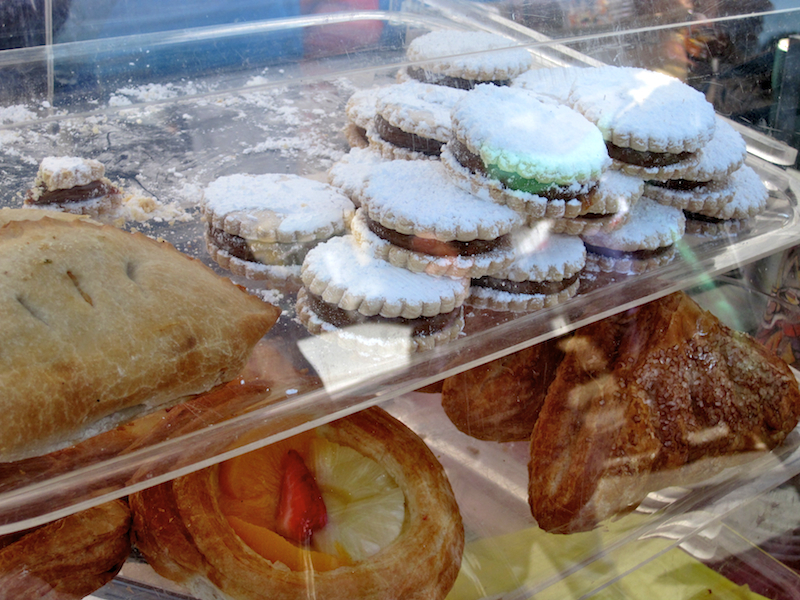 As tempted as I was, I refrained from getting an alfajore from the Chilean baker lady. That would have been just too far off the mark of the all-natural theme I was going for. But boy did they look good. 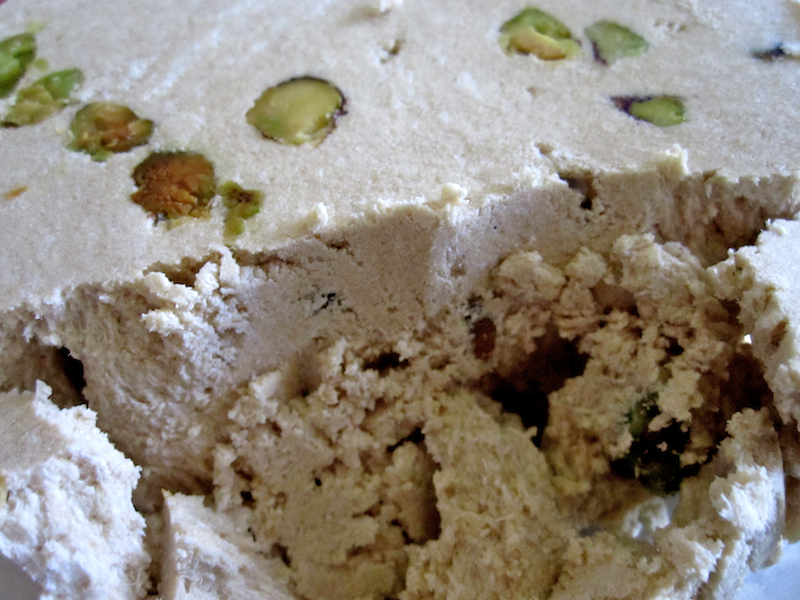 Then for some Middle Eastern flare, The Hummus Guy introduced me to Halva, which is tahini (crushed sesame seeds), olive oil, honey, and pistachio. He originally had me try the chocolate “americanized” version, but I retorted, “what do you take me for, I want the original!” and off I was with the pistachio version. So yummy, the best way I can describe it is that it makes me think of dry icecream. It is smooth and almost creamy, but dry and room-temperature. Ultimately, it’s the appreciation of the food and intention behind the eating that determines whether the food will be nourishing. Mindfulness, as is the key with all action, will ensure that that’s the case. I revisited the program in my hands, squinting to re-read in the dark the same address I had already memorized in the light just a few minutes before. As we stood hesitant on the sidewalk, a young couple walked by us and confidently opened the door and slipped inside. With a shrug I followed suit, making my way up a wooden staircase, a bit anxious of what awaited me. This seemed like any other SF apartment, and part of me felt like an intruder. I was immediately comforted by the crowd of people I found at the top, and quickly became part of a bottleneck in a narrow hallway that led to an overflowing livingroom space. I could hear the lyrical sounds of a guy singing and playing guitar, and the warm smiles of the strangers I found myself pressed up against washed away any residual fears. I smiled back. Settling into the intimate setting, I became immersed in the wonderful music that was being freely and generously offered to me. Suddenly my breathing relaxed and I felt bright and at home. It was the relentless search for this very feeling that brought me to San Francisco. The feeling of belonging, of being nurtured by my environment. Who knew that I would find it in a stranger’s home. But here I was, at my warm initiation into MAPP (Mission Arts Performance Project). Turns out that this venue, aptly named “Pathos,” is a regular at the MAPP events, curated by the veterans of the project. And I now consider myself a Pathos veteran, having returned for subsequent MAPP events and even MAPP planning meetings. MAPP occurs on the first Saturday of every other month, and most recently, last night. 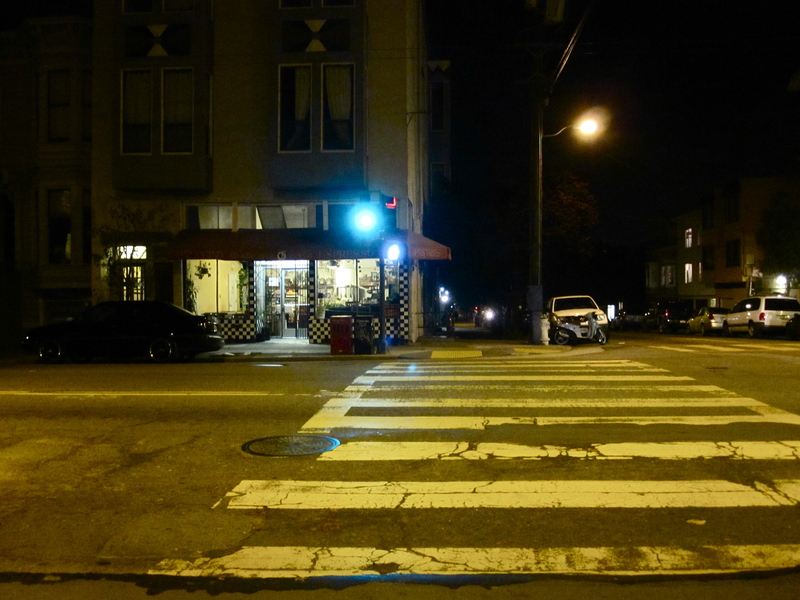 I began my MAPP experience with an energizing walk down Mission St, taking advantage of the unusually warm SF night. The Mission is vibrant with wall murals, cute Latin cafes and taquerias. One mural I found particularly eye-catching is titled “El Inmigrante.” Looking at it, you can see why. It is fitting that MAPP lives in this soulful and culturally rich area of San Francisco. Tonight my first MAPP stop was at the Red Poppy Art House, where an upbeat Latin band was getting the audience up on their feet and busting out salsa moves. The same vibe from Pathos was present here in this small artists space, and intoxicated by the joyful energy and music, I made a vow to myself that I would become a more regular participant in this community. After the set was complete, I made my way to Pathos. As was the routine, I patiently stood in the narrow hallway, allowing an out-tide of people to pass by me and down the stairs before being part of the new in-tide of visitors. I found a stationary spot behind the kitchen bar, facing the living room “stage.” Jorge Molina was improvising on berimbau, before experimenting with playing the didgeridoo into the resonant chamber of the grand piano. Since exploring sound has become a passion of mine, I am particularly moved by Jorge’s improvisations, and look up to him (and his “Spontaneous Combustion Orchestra” band members) as the type of musician I strive to be. Absorbing the energy of the smiles around me, I melted into the music and was home once again. 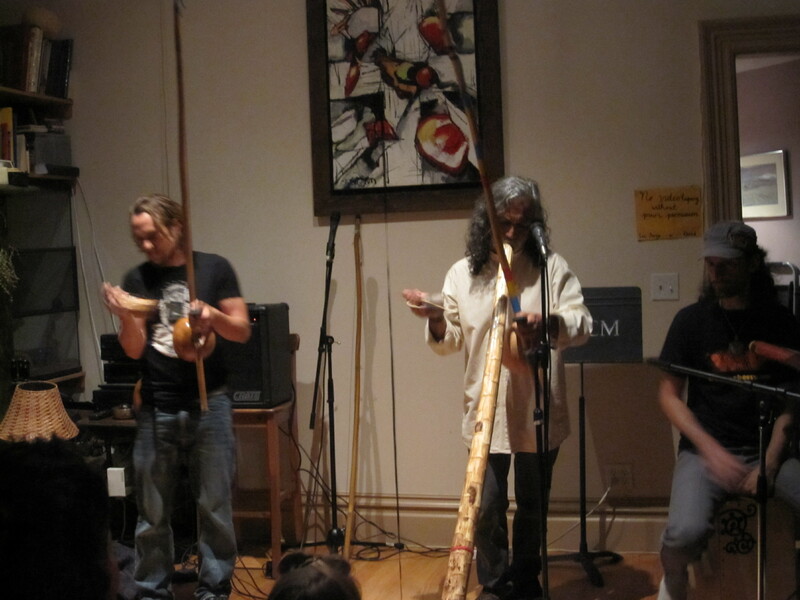 Here, Jorge (right) is playing didge and berimbau at the same time.